To make my R2-D2 model as realistic as possible, I had to collect anything about R2-D2. I especially searched for blueprints, drawings and pictures of the interior, but these were, understandably, very rare. This was years before the Internet ! The best lead the Artoo-builder may find to start with was the "StarWars Blueprints", published in 1977 by Ballantine Books. 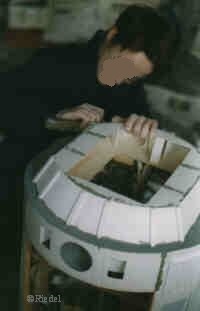 They contain ten blueprints of various StarWars props and stages, among them an side elevation of an (early) R2-D2. This blueprint includes one dimension of the step distance, which makes it possible to calculate the scale of the blueprint (1:2.566) and from that the diameter and a lot of other dimensions. Today we know that this blueprint was just one in a series of prints made for the Norank company in Britain that built the R2-D2s for A New Hope. These "Norank prints" as they are now known are not always close to the final Artoo; there were probably some changes made while he was build. From the Blueprints one does calculate a height of 107,8 cm (about 42 1/2 inches). I measured a height of the R2-D2 at the Smithsonian Exhibition in Washington, D.C. of about 107-108 cm, which very nicely confirms the blueprints. What you don´t get out of it are dimensions in width. These I got from the blueprints in issue #1 of the "StarWars Technical Journal" by Shane Johnson, published by Starlog Press. I calculated a body diameter of a bit over 18 inches (46.3cm). However, for my project I had to resize it slightly, because you only get plexiglass spheres in metric sizes overhere and the next size was 48.0cm. But the difference is so small, nobody notices it. At the time I was building my R2 unit, there were no accurate drawings available, so I made my own crude sketches out of the main dimensions above. 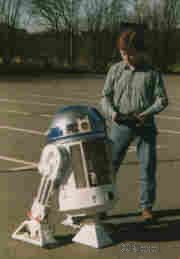 At that time, just some years ago, there was no Internet, and one would have never dreamt of getting into contact with R2 builders around the globe. When the Internet came into full swing, people all over the globe started to draw Artoo-Deeetoos. I made a few crude sketches with Autocad, but never got far. Robert Jackson published some very good drawings on his www.thedroidworkshop.com. Sadly this page seems to be offline at the moment, but try it in the Internet wayback machine. A bit later Dave Buckley from Down Under made an excellent set of blueprints that were already VERY close to the original. You should still be able to get these prints on Dave´s site www.ramjet.8m.com. 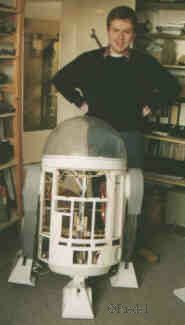 But then, one day the R2 builder´s club managed to create the impossible: Several members were able to get close enough to a genuine R2 unit to take measurements. They created a set of drawings that became known as "The Official Blueprints". Not "Official" as in Lucasfilm, but these were created to get a common standard for every R2 builder, so that parts from every continent should be interchangable. Most of the burdon of creating these fell onto the shoulders of Jerry "JAG" Greene. You find these blueprints on the R2 builder´s Yahoo page (see Links/Credits) and on astromech.net. I started the model by building moulds for the legs and for the "head dome", which I planned to do in fiberglass. I used a styrofoam dome for the head, covered it with vaseline and then with lots of plaster. In this negative mould I laminated the head dome with glassfibers and polyester resin. Some weeks after I had finished the detailing on this glassfiber dome a friend and co-R2-builder, Alexander Landgraf from Nuremberg, Germany, called me to tell that he had found a very light plexiglas coupola in the right diameter. This would save about a kilo (two pounds) of weight, so I ordered it and redid the whole detailing process. For the legs I built a `positive shape´ out of wood, plastic sheet and other stuff, then I constructed a rather complex negative five-piece-plaster mould. This was necessary, because the legs have a quite deeply recessed shape that would probably destroy a one-piece mould. After all, I would need the mould at least twice, since R2 has two legs. I "pulled" two glasfiber leg parts out of the mould, but after that the mould was finished. You would really need silicone moulds like the pros to get more pulls from a mould. The glasfiber parts were completed with several fittings for the attachments of the feet and for attaching the legs to the body. If you need a head dome today, Alexander sadly can no longer deliver them, but there´s an excellent clear dome availiable from a lot of sources in the United States as a "birdfeeder". This a supposedly a clear dome to protect a bird feeding place. Check your favourite search engine. 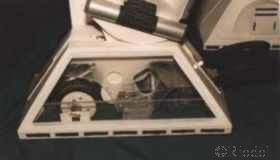 Of course you also find several sources for great custom domes out of aluminum in the internet via the R2 builders club.. The body, consists of an interior structure made out of aircraft plywood and an outer shell made of several layers of 1mm (approx.1/16") polystyrene sheet. This has the advantage of providing a very rigid, yet quite lightweight body. The body has to take considerable forces when R2 is driving around, and with the plywood inner structure one has, as we engineers say, defined load paths, which means you know which part carries which load and that makes it easier to calculate the neccessary thickness. 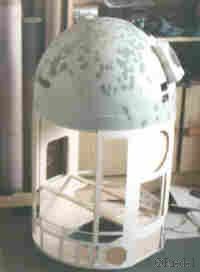 You can see the interior structure on the picture below (where you can also see the old fiberglass head cupola without much detail yet). What´s still missing in this picture is especially the whole mechanism for the retractable middle leg. Most of the little doors and flaps on R2´s body are moveable. The doors are closed by spring action. All important hatches have quick access releases, so I can open them quickly without tools. So far I finished only the blue arms at the front and two of the arms in the vertical doors at Artoo´s frontal sides, but I don´t have the latter ones attached because I want to keep zhe weight down.. 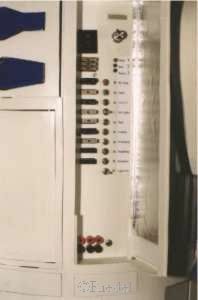 Beneath the left front door (as seen from R2´s direction) is the main electrical control panel. Here you will find all the main power switches for the batteries, fuses, LED´s to indicate power on, and so on. I used seperate circuits, switches and fuses for every electrical thing R2 has onboard so I am able to switch off circuits if they are not needed or if they don´t work as planned in a critical moment. I have a hidden external main power switch, so I can if neccessary cut all electrical power in an instant without opening any hatches or doors first. R2 with the new dome. Still quite a bit of work to do ! Once again the feet have a force-carrying structure and a rather light outer shell. Yet in case of the feet I finally used quite thick (1/8 inch; 3mm) styrene because my experience shows that whereever Artoo shows up, R2-fans try to hug him and invariably step onto his feet. The force-carrying structure consists of a 1/4 inch (6mm) acrylglass plate. 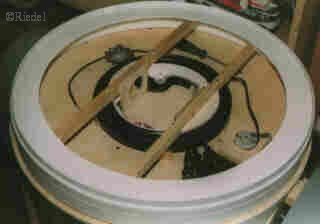 To this plate the motor and the ball bearings that carry the shaft of the main drive wheels are fixed. The drive wheels have a working clutch mechanism inside which enables me to push or pull R2 around when these clutches are free. The feet are open at the bottom to give access for maintenance and repair. Additionally the rounded boxes at the inside of the feet are detachable. 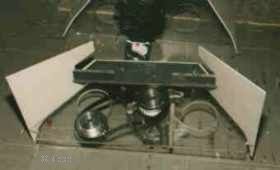 Inside are the electrical drive motors which only fit because of their canted reduction gear. There is space provided in the feet for little microswitches which are supposed to stop R2 automatically if he runs against an obstacle. Artoo´s foot in a very early stage of construction The (almost) finished right foot with open maintenance hatch. The left foot viewed from inside with the rounded cover box taken off. The left foot seen from the front. The head is turned by another windshield-wiper-motor, but a very small one. This drives the head via two sprockets from a bicycle and a bicycle chain. The bearing for the head is made from a large turntable-style ball bearing used in swiveling stands for TV sets. The rotating head base. In the upper left corner you see the sprocket wheel turning the (still missing) bicycle chain. My wife sanding Artoos body. The head almost finished. The grey tube is the launch rail for the lightsaber. Artoo-Deetoo´s third leg can be extended and retracted electrically. This is done with a little geared electrical motor that drives a long threaded bolt. I provided the means in the legs and the hull for another set of motors to move R2 from the two-legged to the three-legged position and back, but this is still in the works (I have to save some work for the coming years). The front flashing light alternates between red and blue, while the rear one changes from green to yellow and back. The flashing ones do flash with the same frequency as in the movie, unless I turn the head. For some strange reason, the lights flashed much faster when the head turns. Dave Everett gave me the hint why the lights do that and what can be done about that. It´s because a flip-flop circuit like the one used for the flasher uses the charging of a capacitator for timing. If now the head motor starts to work, the overall voltage in the system drops, and the charging time is changed. I will use an independent power supply of some kind for the flasher circuit to solve this. Thanx very much, Dave ! One of the quite unique gadgets of my Artoo was an idea of my wife Britta at first. She proposed I should provide the possibility for mounting her videocamera inside R2´s head. Quite a nice idea, because we would be able to tape people´s reactions to R2. But shortly after that I stumbled over an advert for a very small b/w video camera that even included a transmitter inside its tiny body for transmitting the video picture over a distance of up to 300 meters (~300 yards, ~900 feet). This was great and I had to buy it immediately. Since it has such a small aperture that can easily be hidden it is situated in the black rectangle at the front below the blue eye to give it an unobstructed view. The camera is remotely moveable in elevation, and of course, by transversing the head, in bearing. The picture this camera transmits is crisp enough to steer R2 just with this picture as a reference. Of course, if there would be a small obstacle or a hole right in front of Artoo one would not see it, so I still prefer to steer him by line of sight. A real gadget, but something I just had to have, is the Pop-out-Lightsaber. 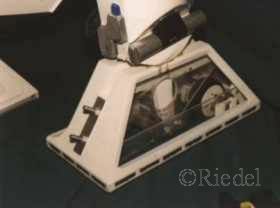 It is hidden underneath the little hatch on R2´s head. A rather nifty safety mechanism first opens the hatch, then the lasersword´s safety is switched off, and only then the Lightsaber is catapulted upwards by two powerful springs. The sword is (for safety reasons) made of very light foam over a plastic tube. Safety is also the reason for the safety mechanism inside R2. I would not want some unknowing spectator bending over R2 when the lasersword shoots out. So I have three safety levels: 1. The sword is only loaded and cocked right before the show; 2. there´s a remotely controlled safety that keeps the sword from being shot off. ; and 3. I can´t activate the launch servo if I didn´t switch the safety off before. I use a very normal Futaba remote control system, a FC-16 in my case. It is programmable to change the settings of the channels more easily. Best of it, you can save these settings as model profiles, so if you fly your model aircraft one day, and then want to change to R2 on the next, you just call up the R2 profile, and there you are. I steer R2-D2 like a tank, which means the left stick forward makes the left foot drive forward, while right stick forward means right foot driving forward (and the same backwards). To drive a corner, you just take the inner stick back, then R2 turns in this direction. For pivoting him, you push one stick forward and one back. Moving the right stick sideways makes the head turn, while doing this on the left stick starts the different sound chips. All other functions are on the different other switches. 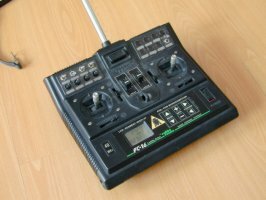 The ILM original is steered with an electronic mixer, so you have just one stick for forward-back and sideways. The powered 3rd wheel on the EP2 ILM Artoo is also mixed in with this, so this makes for very neat cornering. Well, and then came the beautiful spring sunday when I did for the first time pack all my R2´s parts into my car and drove out to the local shopping mall´s parking lot. I assembled R2, who was still looking a bit unfinished, put in the batteries, switched on the remote control with trembling fingers, and then pushed both speed joysticks forward. And forward he drove, slowly at first, but then I switched to the second gear (24 Volts), and his speed became movie-like. It was an amazing day, the fullfillment of years of hard work. I still had some detail work and painting to do, but now I knew that my Artoo would indeed work ! I wish everybody of you R2 builders out there the same exhilerating feeling of final success when you finish your project ! Over time, I made a lot of improvements in my R2. Some of them were purely internal, like strenghtening parts that turned out too weak. Some other were additions for new gadgets. Many improvements came along after I met Don Bies (more on that in the "Shows" section. 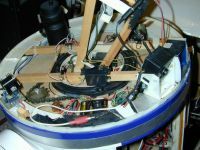 ), since Don pointed out some things that were inaccurate on my R2, and he told me some of the internal workings of the ILM R2. My old Logic Display Indicators (LDI) were simply made of a piece of glass with a wave-like structure, which broke the light of a simple bulb behind it. No motion in the light whatsoever. After Don told me even the 1977 originals were actually made with fiberoptics, I needed to have this, too. But I couldn´t get the neccessary 3 mm fibers anywhere, so I bought a roll of 1 mm fibers, and a bunch of 3 mm solid plexiglass rods. Using a template I cut about 310 pieces of the glass rod, each 25 mm (about an inch) in length. This was the easy part. Then came the fun part: I drilled a 1 mm hole right into the center of the 3 mm rod piece, and this for every one of the 310 rods. Of course I made another drilling template for this, otherwise I would have gone mad. I needed the better part of a weekend for this. Next I placed the needed amount of rods side by side onto a flat surface and glued them together with cyanoacrylate glue (superglue). The stuff works like hell on shrinktubing. Then I combined several rows of rods into the neccessary block that forms one of the LDI´s, and glued this together with superglue. I placed a frame around this block,and then filled this up with epoxy resin. Don´t mind of the resin gets on the front of the glass rods, you will need to sand these anyway. After the resin has thoroughly dried, I sanded the block surface smooth. I used finer and finer sanding cloth, and finally changed to a polishing cream. Now the glass rods were clear again. The light box was made from polystyrene, and it contains six lightbulbs of 4 watts each. They are illuminated one after the other by a "running light" circuit, whose output I needed to amplify to cope with the 4 watts. The box and the LDIs were placed inside the dome and the glassfibers were attached to the lightbox. I tried to vary the placement as much as possible to avoid spots of adjoining rods to light up at the same time. It was the year 2003. The belgian R2 builders invited us to FACTS convention in Gent. There I met for the first time with Marco "Xeno-Man" and "Admiral" Wim. This extremely cool meeting led to JediCon2004, where we managed to get our own R2 builders table. There for the first time I saw a set of John Sherell aluminum skins and the famous R&J dome. First, I rejected all this alu stuff as unnecessary, but somehow it looked cool..... Slowly the idea of a new R2 crept up in my mind. There were alot of things to be improved on my old R2. At JediCon Marco showed his new Scooter motors. His R2 was so fast, he had to throttle the motors to 70 %, ands it still was fatser than a man running. Scooter motors definitely were far superior to the windshield wiper motors I used. 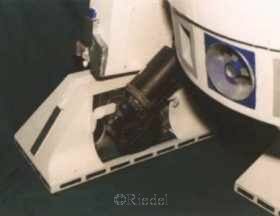 Then I had way too much leg spread in my old R2. I tried to fix this by making new shoulder joints out of steel and aluminum tubes, but the shoulder joint remained too weak. 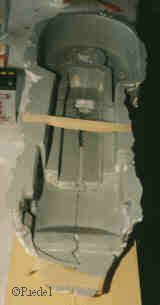 I also needed auxiliary brackets between the legs and the body (the famous "ILM bars"). I wanted to get rid of these. I decided not to improve the old R2, but to build a completely new one. I ordered a set of John Sherrell skins, a rockler bearing and a Formosi dome. Later I decided I had so little time on my hands (due to my demanding freelance job), so I gave the Formosi into good hands and ordered an R&J dome. The frame in my new R2 is again made of multi-layer plywood (called a "printing plate" overhere). This stuff is extremely strong and yet much lighter than aluminum of the same thickness. I went a way differetn from the popular frame designs and decided to have a transverse plate in the body right in front of the 3rd leg. My experience shows that there are strong transversal forces acting on R2´s body, and he needs some stiffness there.